At work, physicists Leonard and Sheldon and their geek pals conquer the cosmos. At home, real life - from dating to driving - conquers them. This season, Leonard gets a girl. So does Sheldon. (Sheldon?!) Howard drives the Mars Rover into a ditch. Raj woos a terminator. Gorgeous girl-next-door Penny falls under the spell of Age of Conan. And super-smart, ueberconfident Leslie Winkler reduces mere men to spineless jellyfish. 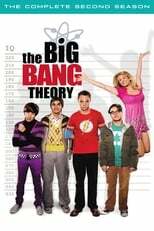 Twenty-three laugh-filled episodes from series creators Chuck Lorre (Two and a Half Men) and Bill Prady (Gilmore Girls) and a talented cast with astronomical comedy I.Q.s show why Big Bang is such a big hit.